The first International İstanbul Festival, organised in 1973 on the 50th Anniversary of the foundation of the Turkish Republic, covered a period of one and a half months and focused mainly on classical music. Soon after, it included other artistic fields in its programme such as film screenings, theatre productions, jazz and ballet performances, and art exhibitions held in historic venues. The Istanbul International Music Festival is a cultural event held every June and July. It offers a selection of European classical music, ballet, opera and traditional music performances with the participations of famous artists from all over the world. From its beginning the festival has hosted world renowned artists and groups. The 31st Festival saw the prominent conductor Lorin Maazel with the Bavarian Radio Symphony Orchestra and a legend of the music world, Cecilia Bartoli, who received an enthusiastic standing ovation from the audience for minutes. İzmir International Fair is the oldest tradeshow in Turkey. The fair and the festival are held in the compound of İzmir's vast inner city park named Kültürpark in the first days of September. The 81st İzmir International Fair will take place in 2012. The fair itself is not limited to a theme, the participants are generally simply required to expose products with export or import potential, although each year a specific field of activity, a country and a Turkish province is put in limelight. Fields of activity or expertise relating to such sectors as the automotive industry, electric tools and devices, electronics, working machinery and equipment, foodstuff and packaging have always been well represented in İzmir Fair. The 2006 fair was expected to be visited by up to a million and a half people. 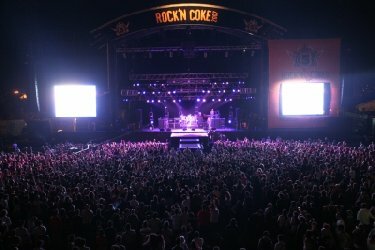 Rock'n Coke is a Turkish rock festival sponsored by Coca-Cola. Rock'n Coke is Turkey's largest open air multiple-stage music and camping festival and has hosted some of the biggest names in alternative rock, pop, electronica and cross-over genres since 2003. It is traditionally held at the Hezarfen Airfield in Istanbul, Turkey. At the end of every summer, the Hezarfen Airfield is used as a venue for a two day chain of concerts, with both national and international performers featured. Although mainly rock-oriented, Rock'n Coke also hosts other music genres. While the main stage is generally reserved for rock and its subgenres, the DJ Arena (now called Burn Stage, following the sponsorship) is reserved for styles such as house music. The Istanbul International Film Festivalis the first and oldest international film festival in Turkey. It is held every year in April in movie theaters in Istanbul. The the festival aims to encourage the development of cinema in Turkey and to promote films of quality in the Turkish cinema market. The Festival features a thematically specialized international competition, provides a showcase for recent Turkish film productions, and thus represents a rewarding medium where Turkish and foreign filmmakers get together. The Festival draws a special interest to world classics, presenting retrospective sections within its programs particularly attended by young audiences. For the first time in 2005, special thematic curated sections were included in the programme which comprises approximately 200 titles, making the Festival the comprehensive film festival in Turkey. With an audience of 170,000 in 2007, it is also considered the biggest film festival. Numerous filmmakers, actors and actresses visited the festival in its 30 film like years, such as, Claudia Cardinale, Catherine Deneuve, Gérard Depardieu, Harvey Keitel, John Malkovich, Jeanne Moreau, Greta Scacchi, Sophia Loren, Bernardo Bertolucci, François Ozon and Paul Schrader. Istanbul International Jazz Festival is a cultural event held every July in Istanbul. It offers a selection of jazz music performances with the participations of famous artists from all over the world. Each year, the festival attracts around 50,000 people to more than 30 concerts held at various historical venues of Istanbul, such as the Cemil Topuzlu Open-Air Theatre, Hagia Eirene Museum, Istanbul Archaeological Museum and Esma Sultan Mansion. 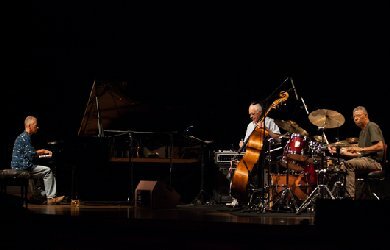 The Istanbul Jazz Festival features classical and modern jazz, Latin and Nordic jazz, works combining electronic music and jazz, and other music categories, such as rock, pop, reggae, funk and world music. Thanks to this diversity, the Istanbul Jazz Festival provides audiences new opportunities for discovery. At the same time, with its daring approach to venue selection, the festival reaches beyond traditional concert halls to Istanbul’s historical sites, streets and avenues, trams and ferries, so as to reach a wider audience. From its beginning, the festival hosted world renowned artists and groups like Miles Davis, Dizzy Gillespie, the Modern Jazz Quartet, Stan Getz, Ornette Coleman, Eric Clapton, Massive Attack and Björk. The Aspendos International Opera and Ballet Festival has been organized by the Turkish State Opera and Ballet directorate since 1994 with international participation by opera and ballet companies from several different countries. The festival is held annually each June and July in the two thousand year old ancient Roman Aspendos Theatre of Aspendos, near Antalya, Turkey. The fact of being held at an antique theater like Aspendos, whose history goes back to 166 A.D, gives a distinct meaning to the International Aspendos Opera and Ballet Festival.s The theatre is noted as one of the best preserved antique theatres in the world, with many original features of the building remaining intact. A wide variety of productions have been presented by companies such as the Ankara State Opera and Ballet (a popular opera such as Aida) and the Mersin State Opera and Ballet with La Bayadère by Léon Minkus, Carmen (Georges Bizet), and Carmina Burana by (Carl Orff). Other companies included the Zürich Ballet, the İzmir State Opera and Ballet (which presented Jivago/Zhivago by Alexander Borodin), and the Deutsche Oper Berlin with The Magic Flute.